Receive an Apple iPad for Your Classroom! Binder of 3rd grade writing samples collected by Denise Dusseau for next year’s class. Once teachers have a strong foundation in the WriteSteps lessons, collecting class samples can be a great way to honor student work. Denise: WriteSteps provides dozens of excellent anonymous samples for each grade, but I started creating my own collections before I had them, back when I was still using the Lucy Calkins program. If you have lots of authentic sample writing to demonstrate your teaching points, collecting samples from your own class can still be powerful. Why? I mentioned in an earlier issue of Inspired Writer that when I started using WriteSteps, I saw a wonderful change in the writing of my students who have learning disabilities or ADD. They used to have a hard time getting anything on the page, but now they’re motivated, they’re staying engaged, and they’re making real strides. If you only show your class mentor texts that illustrate exemplary writing, your students will miss out. Not all samples we use should be models of what we think our students can achieve. What we want from sample writing is to improve it and learn from it. Weaker samples can be highly effective as long as you teach students to be very respectful in the way they analyze all writing. In my class, we look at a poor sample and say, “It’s not a bad piece, it just needs more work. This is a really good foundation. Now what does it need?” As a result, my struggling students aren’t ashamed of their writing anymore. Click above and scroll to view all three pages, including a student writing sample. 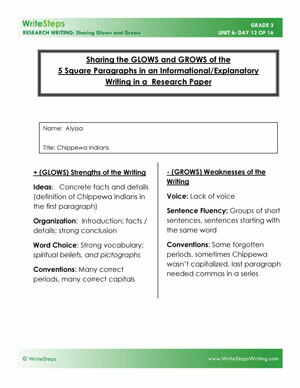 In practice, teachers display the sample and use this accompanying guide to lead students in identifying the strengths and weaknesses in the piece (“glows” and “grows”). This is the reason I originally started collecting my own samples. The samples from the Lucy Calkins program didn’t work for my students. They were very urban, but I live and teach in a small Midwestern town and my students just couldn’t relate to them. There was one piece about a friend’s parent getting shot, and others about going to the opera and symphony. Those things just aren’t a part of my third graders’ experience. I use a 3-inch binder to save four to five samples of my own students’ writing from each genre. I include writing samples from high, medium, and low performing students, blacking out the names. I keep the samples anonymous. At the end of the year, I’ll have a binder full of examples demonstrating all the genres my students have practiced: explanatory writing, personal narratives (real & imagined), informative writing, opinion writing, folktales, and research. I’ll keep these out in my classroom for next year’s 3rd graders to look at when writing their own pieces. I often include a student’s planning tool with the final piece, so they can compare these and see how the writing evolved. 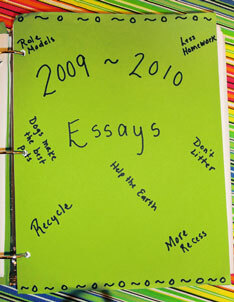 I only started creating these class binders a couple of years ago, but I wish I had started earlier. I can see that my students’ writing is getting better, because my instruction is getting better. I can also use my sample collections when I am evaluated. I can pick six students, track their progress in a binder, and give that to my administrator to demonstrate the skills I have given my students. It’s a wonderful way to show growth! I think it’s important for new WriteSteps teachers to wait a year before collecting their own samples. Seeing a range of WriteSteps samples prepares you to recognize the different levels of writing you’re going to see. Give yourself time to acclimate to the process, watch your students improve over the course of the year, and try these ideas next year. Let us know how it goes so we can share your successes! Lifetime Television has revised its on-air schedule! Tune in February 21 and 28 at 7:00 a.m. to see WriteSteps Founder & CEO, Suzanne Klein. 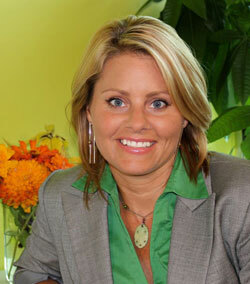 She will discuss empowering teachers with well-designed Common Core writing lessons. We’re still celebrating the launch of our online teacher portal, eWriteSteps, featuring nearly 600 Common Core writing lessons, 28 teaching videos, and hundreds of student writing samples, rubrics, and other instructional aids. Teachers, take notice! If you help bring WriteSteps to your school, we’ll give you a FREE Apple® iPad2® in three easy steps! Ours is not your typical “talk at you” professional development. We gather grade-level teachers together in small groups to refine skills and address specific classroom needs, giving teachers tools they can use immediately to improve learning outcomes.